Pub right next to East Finchley Station. It's part of the Mitchells & Butlers Castle sub-chain. 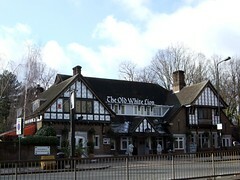 This large pub has plenty of space for drinkers, with several rooms. The bar is opposite the main entrance, with seating around it. There's also a separate room to the right of the bar, with sofas and spacious tables. The place feels cosy despite its spaciousness, with decor suited to the up-market local population. There's a large beer garden out back as well. There are several handpulls for beers, with London Pride, Landlord, and some guests on, including a mild on Ewan's February 2009 visit. The food menu is standard M&B pub grub, including burgers, salads, pies, pasta dishes and the like photo of menu. Ewan's spinach and lentil burger (£8.40 including blue cheese, mushroom and BBQ sauce on the side) was tasty, with a reasonable amount of chips photo, though could perhaps have been a little more for the price. Jo enjoyed her halloumi salad, which had three large chunks of halloumi, and also included mushrooms, and was served with croutons on the side photo. Opening hours taken from the 2008 Good Beer Guide. Last visited by Ewan and Jo, February 2009. Last edited 2013-06-06 12:36:47 (version 15; diff). List all versions. Page last edited 2013-06-06 12:36:47 (version 15).